Buyer behavior is changing. Because of all the information readily available on the Internet, buyers now have the power in the buying-selling relationship. And because they don’t need to come directly to Sales reps for information, you may have less opportunities to even make pitches. Considering that 53.2% said they can be reached through free informational content, 48.3% can be reached through appearing in search results when looking, 34.6% through email marketing, and 27.4% through social media, it’s clear that prospective buyers can be reached–if you use the right methodology. While adopting Inbound Sales is a process, these 10 Inbound Sales tips will set you on the right path–toward the right buyer. One of the best things about the Internet is that it’s open to everyone–including your Sales reps. Just like your leads and prospects are researching into their problems and into your solutions before contacting Sales, your reps can learn about your buyers before making the first call. Research your prospects on LinkedIn and Twitter, and check your marketing automation software to see what they’ve been up to on your site, before your call. Not only will it give you something to talk about and a segue into conversation, it will also make the call more personal (a growing expectation for buyers). Inbound leads–leads who sought out your website and your product/service–should be a top priority for your reps. Research shows that reps are mostly likely to get a response from inbound leads if they make contact within the first 5 minutes, and that the likelihood of a response decreases more than 10x after the first hour. As mentioned, buyer behavior has changed. Buyers perform much more research before making a purchase, and so it’s smart to help the prospects you contact with this research. After an introductory call, for example, pass along an eBook or other marketing assets that will help them make this decision. This will position you as an advisor and will help you earn your prospects’ trust. A strong alignment between your Sales and Marketing team will only strengthen your odds of winning new customers and growing your business. By having the two teams on the page, aligned around inbound, you can provide a consistent message to your buyers. Additionally, by maintaining a relationship with Marketing, your Sales reps will know what assets–what blogs, eBooks, white papers–Marketing has created that your reps can use to always be helping. As mentioned above, today’s buyers want a more personalized experience when dealing with Sales reps and when spending their money. Researching leads on social media and on your marketing platform will set you on the right path toward building a relationship, as will choosing to always be helping. Additionally, you can enroll leads in workflows or email campaigns aimed to continue delivering educational content. 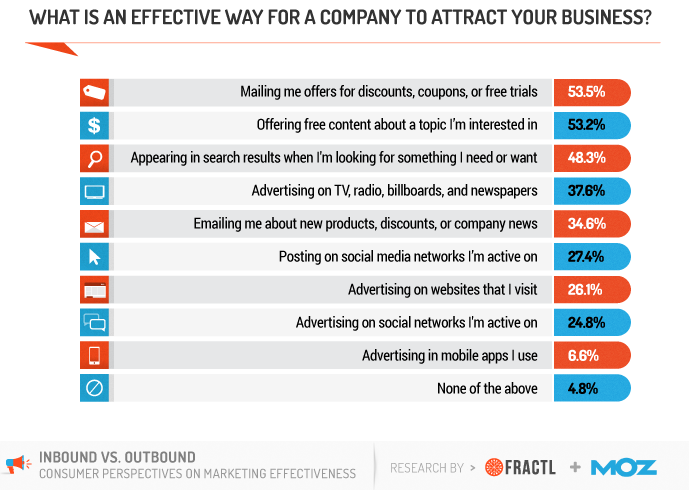 As shown in the Moz/Fractl study above, 27.4% of buyers agree that a social media presence is an effective way of reaching them. Social media sites like Twitter and LinkedIn give Sales reps a place to build their authority. If a customer researches a rep after having an introductory call (which they’ll likely do), and sees that the rep shares blog posts relevant to their problem, the trust and the relationship will grow. The fundamental shift in power from seller to buyer means that Sales reps need to rethink the “Sales Funnel,” particularly from the buyer’s perspective. The Buyer’s Journey, explained in detail here, follows the buyer through Awareness, Consideration, and Decision stages, equivalent to the Top, Middle, and Bottom of the Funnel. The most important part to remember about the Buyer’s Journey is that, depending on which stage they’re in, the buyer needs and wants different things. In the Awareness Stage, for example, they want information on their problem. It’s not until the Decision Stage that they’ll want to see promotional, product-centered information. If you’ve #1-8, you might be a tad overwhelmed. However, there are numerous software platforms on the market that make all of these tasks simpler. Marketing automation software and customer relationship management (CRM) software, like HubSpot and Salesforce, can automate a number of these tasks, allowing your Sales reps to continue focusing on building a relationship with leads and opportunities. However, if we were to make just one final suggestion, it would be to remember that the shift in power has resulted in a new obligation for Sales to focus on what their buyers need and want, and not on why their product, service, or brand are the best on the market. At the end of the day, what matters most is the help you provide to prospects and the relationships you build.